Known as Abraham (إِبْـرَاهِـيْـم) in the Old Testament is recognized as a prophet and apostle in Islam. In Judaism, he is the founding father of the Covenant, the special relationship between the Jewish people and God; in Christianity, he is the prototype of all believers, Jewish or Gentile; and in Islam he is seen as a link in the chain of prophets that begins with Adam and culminates in Muhammad. Abraham sacrificing his son, Ishmael (Ismael) and archangel Gabrial presenting him with a lamb to be sacrificed, a partial folio from the Zubdat al-Tawarikh (زبدة التواريخ). The Islamic tradition recounts that it was Ishmael who was to be sacrificed by Ibrahim in contrast to the Biblical tradition where Isaac is to be sacrificed. 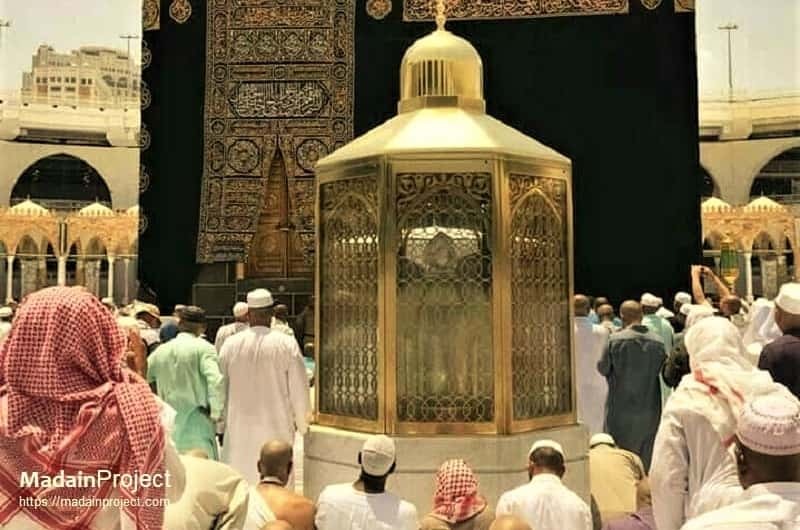 The tradition recounts that Allah asked Ibrahim to sacrifice his son as a test of his faith and at the last moment he (son) was replaced with a lamb miraculous. Remains of city of Ur the birthplace of Ibrahim, Nassiriyah, Iraq. The great Ziggurat can be seen in background. Ur is likely the city of Ur Kasdim mentioned in the Book of Genesis as the birthplace of the Jewish, Christian and Muslim patriarch Abraham (Ibrahim in Arabic), traditionally believed to have lived some time in the 2nd millennium BCE. However traditions and scholars also identify Sanliurfa, Urkesh, Urartu or Kutha as the birthplace as well. The Cave of Abraham (İbrahim Mağarası) in the Mevlid Halil mosque. Prophet Ibrahim is believed to have been born here in this small cave. According to tradition before Ibrahim was born, a portent in the stars tells Nimrod and his astrologers of his impending birth, who would put an end to idolatry. Nimrod therefore orders the killing of all newborn babies. However, Ibrahim's mother escapes into the fields and gives birth secretly. Abraham's Gate, the eastern most Canaanite bronze age gate at Tel Dan also Tel al-Qazi (تل القاضي), is made of mud bricks on top of megalithic basalt standing stones. Dubbed as the Abraham's Gate, due to the biblical story that prophet Ibrahim traveled to Dan to rescue his nephew Lot (Islamic prophet Lut) from captivity. Pool of Sacred Fish near the birthplace of prophet Ibrahim at Mevlid-i Halil Mosque. According to Muslim belief, this fish-filled pool is where Nimrod threw prophet Ibrahim into the fire. It is located behind the small Ottoman era Rizvaniye Masjid. The story says that when Ibrahim landed in the fire, Allah turned the flames to water and the burning logs into fish, hence the translation of the Turkish name into “lake of fish”. 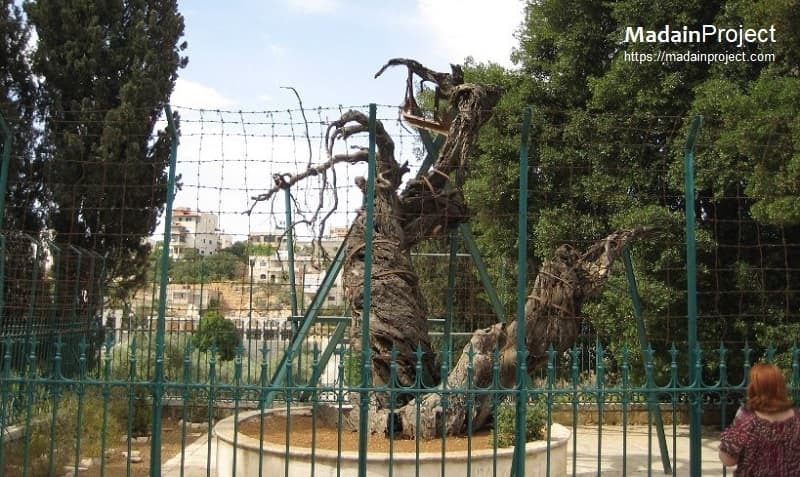 The oak of Abraham (Ibrahim), also Oak of Mamre, is purportedly some 5,000 years old, where prophet Ibrahim is believed to have pitched his tent. In the biblical tradition the patriarch Abraham pitched his tent here and entertained three angles. He as also said to have built an alter here. Although the tree has been dead for years now, a new sprout was seen appearing in 1992 CE. Illustration of of Terah (تَارَح‎) in Latin from "Promptuarii Iconum Insigniorum". In some Islamic sects, Abraham's father is believed to have been a disbelieving man. The earliest story involving Abraham in the Quran is his discussion with his ab (أَب), meaning father. The name given for this man in the Qur'an is 'Āzar' (عازر), though Arab genealogists related the name of Abraham's father as 'Tāraḥ' (Arabic: تَارَح‎). "Tomb of Abraham," cenotaph above the cave traditionally considered to be the burial place of Abraham and Sarah in the Haram al-Ibrahimi (Cave of the Patriarchs). Biblical tradition recounts the it was the patriarch Abraham who bought the property when his wife Sarah died, around 4000. Other people believed to be buried here are Isaac (prophet Ishaaq) and Rebekah (Rifaqah), and Jacob (Y'aqub) and Leah.